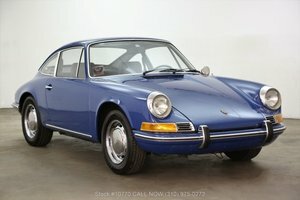 This beautiful original Porsche 912 is of the first series and fitted with 3 dials. The Ruby-red 912 has the original engine and gearbox as the car came from the factory 53 years ago. The instruction Manuel from 1965 is there. The birth certificate states that the car comes from USA Pacific. What is not original: the sport exhaust system, but has a very nice sound. More information on: http://www.kucarfa.nl Visit only by appointment!